Outdoorsy. Homeschooler. Mother of six. Bookworm. Bird-nerd. Celiac. Christian. After eating mostly Paleo for about eight years, it stopped working. I don’t know what the deal is, but I’ve talked with other Paleo people who have had to switch up their eating habits, as they have started to gain weight, even while eating grain-free, sugar-free, refined-foods-free… It doesn’t seem fair, but I had to decide to do something different. After gaining about ten pounds since Jean was born, which put me at 160 lbs — the most I’ve ever weighed, non-pregnant, I started hiking at the end of November. I went two or three times a week, early in the morning, 3-4 miles at a time. In that time, I didn’t really change my eating habits. So, what did that effort net me? I gained eight pounds. Ugh. And, no, it wasn’t muscle. Well, maybe one pound was muscle. So, in the last month or so, I started tracking calories — something I’ve NEVER done before — on My Fitness Pal. I also started running more often, in addition to hiking. I’m now running or hiking, four or five times a week. And what has all that tedious tracking and MORE exercise netted me? A loss of five pounds for the month. It seems like very little in return for such effort, and I’m still way over the weight at which I feel comfortable. But, it’s five pounds. And I ran my first 10K. That’s 6.2 miles. I came in last for my age group… But I finished! I ran the first four miles (slowly) without stopping, then walked for a minute or two, ran the rest of the fifth mile, and then walked/ran the sixth mile. One hour, 23 minutes. I’m running to improve that time, and also hoping to complete the Phoenix Summit Challenge, which is in November. So, this photo has a copyright on it. I’m aware of that. I *DID* purchase a photo from the photographer, but it won’t be delivered for 2-3 weeks, at which time I’ll update this with the “real” photo with no watermark. Today is the last day of 4th grade and 2nd grade for Audrey and Fiala, respectively. I’m kind of relieved, and I have a VERY long list of summertime projects from the mundane to the complicated. Grant, who is in 11th grade, is still doing work, mostly because he didn’t do enough during the school year. Sigh. Thanks to the homeschool group that I (very loosely) lead, we have a fabulous end-of-year party tomorrow. I really stink at planning parties, so I’m pleased that, while I had the idea for the party, other people who are much more skilled than I am are planning it. Speaking of the homeschool group, we have 210 families who now are members. THAT IS A LOT OF FAMILIES. I kind of envisioned 15-20 families, but the group meets a greater need than I knew existed. We have attended weekly park days, near-weekly field trips, and I lead a (typically small) mom’s night of grading and chatting every week. And the girls are in piano lessons. It has been a good year of homeschooling for them, which was my goal. Tomorrow is my son Wesley’s last day of 9th grade at a local charter school. It was mostly very successful: He loves it, but his grades aren’t the best I think they could be. As long as he finishes the year with a 3.0 or higher (which he almost certainly will), he will most likely be returning in the fall. 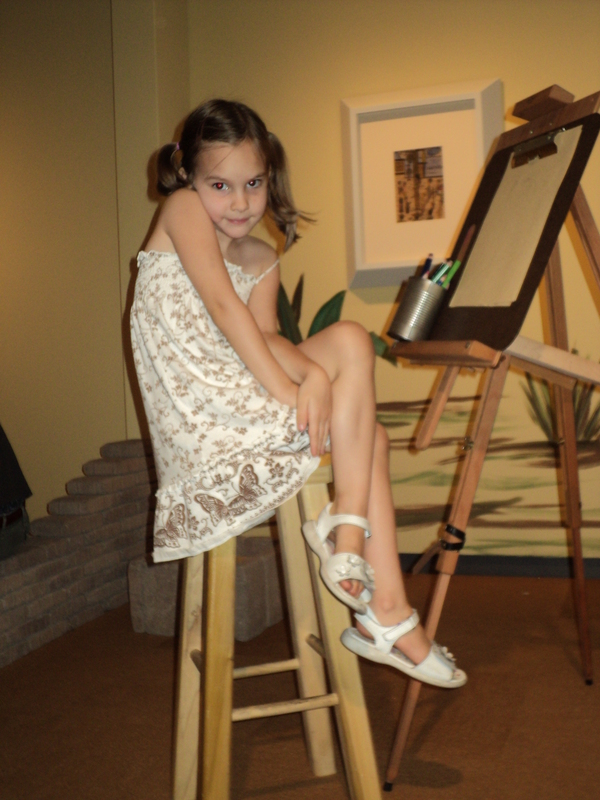 “Baby” Jean is no longer a baby: she will be three years old next month!! She is bright, full of fun, and VERY active. Grant promoted to the rank of Chief in Civil Air Patrol Cadets on Monday. My oldest son, Ethan, who attended Arizona State University on a near-full scholarship this last year, very likely won’t be returning to school in the fall. From my perspective, this really isn’t a good situation, and I cried for two hours when it all came down. But, my son is almost an adult, and he’s making more adult-y decisions, and that’s hard when your children don’t choose for themselves what you, as the parent, see as wisest. But, God is faithful, and Ethan’s times are in His hands, and this is an opportunity for faith on my part, bathed in prayer. Still, it feels like a failure on my part. I don’t know if it is, but it FEELS like a failure. My garden is thriving. It’s nearing the searing heat of summer, and I’m hopeful for its continued success. I have two beds: one is 8′ x 12′, and the other is 12′ x 12′. I am tracking, by poundage, how much I harvest. These past winter months, things DO grow here, but more slowly. I’d typically harvest 4-6 lbs of produce. Now that it is warmer, I’m harvesting 8-12 lbs each week. A couple of weeks ago, when I harvested the last of my beets, it was 16 lbs, 6 oz for the week. I am currently reaping: I’itois onions (bunching onions); Greek and Italian basil; Cardinal Chard; Top Bunch Collards; Tyfon Holland Greens; Harris Model Parsnips; four kinds of tomatoes; Greyzini (a summer squash like Cousa or Mexican Grey Squash); Sweet Banana Peppers; and just yesterday, the first of the Homemade Pickles Cucumbers. Soon, I’ll have Sweet White Spanish Onions (the largest have tops that are over 4′ tall! I hope they’re as giant as their tops suggest); Asparagus Yardlong Beans; Garlic; and Honeydew Melon. I’ve also been collecting seed from radishes, lettuces, and cilantro. And, I have at least nine kinds of flowers blooming, including 8′ tall Lemon Queen Sunflowers. And in another 3-4 weeks, I’ll have okra and Armenian Cucumbers. That’s about it from our home. Well, actually, that’s not nearly it. There is always more that is happening than I can write about. And, I don’t know if this update is all that interesting, actually. But, I felt like I was overdue for posting one. 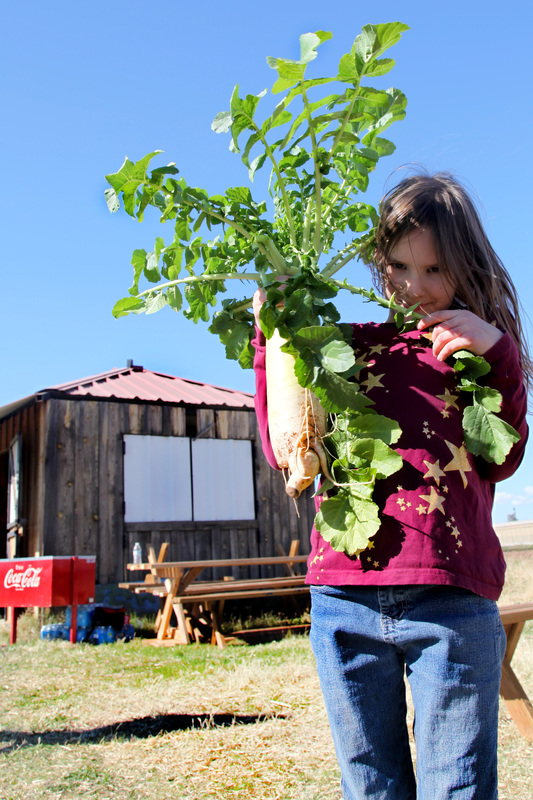 On Saturday, my seven-year-old daughter, Audrey, picked a Really Big daikon radish from the fields at Crooked Sky Farms during CSA Member Day. I think the grand count is now up to six or seven things I’ve made in our nearly-20 years of marriage that he doesn’t like. Maybe eight. I think his presupposition that he won’t like radish kimchi is based solely upon reputation, and report of friends who have gone to South Korea on ministry trips. I found a recipe, and I’m making it right now — waiting for 30 minutes while the cubed radish “sweats”. I’m really happy with all the ingredients. 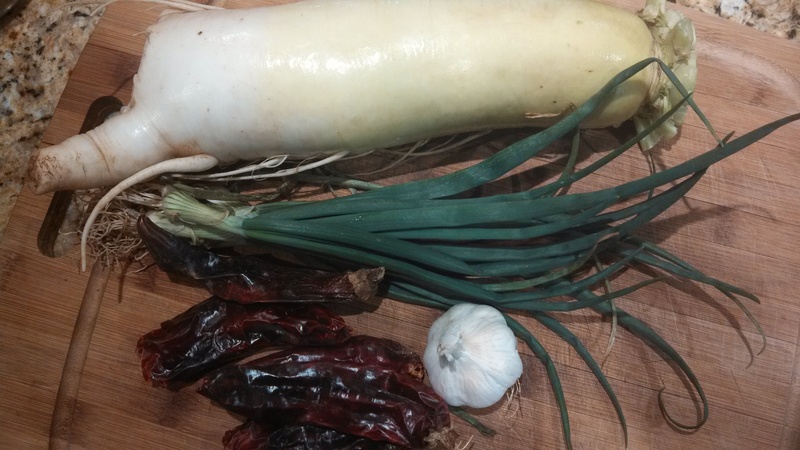 Nearly all of them are organic: the daikon, of course; the green onion; the dried red chile; the sugar — all from Crooked Sky Farms, save the sugar. I’ve also used sea salt, fresh garlic, and gluten-free soy sauce, simply because I’m out of fish sauce. I just realized that I do not have fresh ginger, so my kimchi will be ginger-less. And that big daikon only made one quart plus about 1½ cups of kimchi. I’m only fermenting the quart container. The end result didn’t seem as “wet” as the recipe suggested, so I ended up pouring all the “radish juice” back into the mixture. From other fermented items I’ve made, the veggies must all be submerged in the liquid, and it took adding it all back in to bring the liquid to the top of the quart jar. I had the thought, “I wonder if slightly adventurous cooks in Korea get a hold of, say, tomatoes, and determine that they will make ketchup, that ubiquitous and widely eaten American condiment.” And their spouses look askance and wonder if they have to eat it. The author of the recipe suggests that kkakdugi pairs well with a simple bone-broth soup. Sounds good to me; I have bone broth in the fridge right now! I wonder which of my family will eat Korean Ox-Bone Soup accompanied by Kkakdugi… I’ll try to remember to report back. On a tangential note, there is a lady in the weekly small group Bible study I attend, and one of her daughters is a health-nut. Nearly every week, my friend will report to me of the inedible culinary disasters her daughter has created in the name of health. When I make a dish, I simply cannot make it in the name of health alone; it must actually TASTE GOOD. What’s the point of cooking your asparagus in coconut oil if no one enjoys the flavor, and it ends up in the trash? (Personally, I think coconut oil is over-used. However, that is a tangent to my tangent.) I’ve only brought snacks twice in the last number of months, and both times, she asked repeatedly, while eating with gusto, “This is gluten free?? It’s healthy? ?” To which I usually reply, “Well, it’s not healthy, as it has way more sugar than anyone should be eating. But, it’s gluten-free and it’s nearly all organic.” She just can’t believe that homemade goods can be better-for-you AND tasty. I believe that they should be tasty. I don’t believe in eating something solely because it’s good for you; food should be enjoyed. I used to eat broccoli a lot. It was THE go-to veggie for my family. I’d purchase, at a minimum, enough for two dinners’ worth, and prepared it in innumerable ways, but most often, just steamed. We hardly ever eat broccoli any more. I like broccoli. I just usually can’t bring myself to buy it. I live in the desert, here in the Phoenix area. I know that broccoli is harvested here for a very limited time of the year, usually in March. And how do I know that? 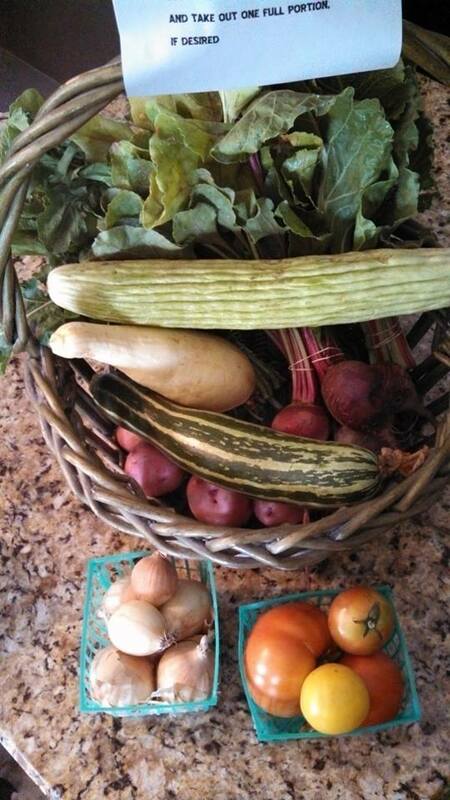 Because a majority of my family’s veggies are from a local farm, Crooked Sky Farms, in a year ’round CSA. Before 2013, our veggies came — for 20 weeks out of the year — from a different CSA. The window for local, fresh, organic broccoli is very small. So, when I’m shopping in the heat of summer, and that broccoli is looking mighty fine for a stir-fry, I ponder and think, “It’s August. It’s stinkin’ 120° out there. I know, Grocery Store Broccoli, that you did not come from any place even remotely close to here.” And I usually pass on by… I might cave if it’s from an organic producer in California; that’s not too very far. But usually, I just pass, and choose a summer veggie. Or, I just live off of what the CSA provides. I purchase very few veggies any more. Year ’round, I do purchase mushrooms, lettuces (when not from the CSA), celery, and red bell peppers (when the CSA doesn’t provide other bell peppers). Islander Bell Peppers — we received these purple bell peppers last week. Sand Piper ivory-colored bell peppers, which were also in last week’s CSA share. That sounds like a lot of purchased veggies. But, really, it’s not, compared to how many veggies our family eats. And when I finally have my garden up and going, it will be even fewer, but that’s another story. I just wanted to send out a note of encouragement to each of you. I’ve heard from several who are growing really weary of eating the same things from week to week. Well, it hasn’t been exactly the same thing, but there have been several items — especially okra and cucumbers — that folks seem to be tiring of. I do understand! I intended to turn a batch of lemon cukes into pickles this past week, and with two different sets of houseguests, I didn’t get that done. I also decided to give away a bunch of okra, rather than freeze it. So, I do understand the weariness. I do, however, want to remind each of you that eating seasonally is much healthier for YOU and for the planet. Studies have shown that produce that is grown seasonally (instead of imported, or grown locally in forced, non-natural environments) to be much higher in nutrient content. I’m not trying to guilt-trip you out of buying broccoli on your next trip to the grocery store, I promise! And in some ways, I do realize that I’m preaching to the choir; most of us don’t have to be convinced of the benefits of eating locally, seasonally, and organically. “Better nutritional content and overall health – Most grocery stores and food chains jazz up their fruits and vegetables to keep them looking attractive and inviting when they’re out of season. This naturally compromises the nutrition level of the food. Non-seasonal foods require bending of nature’s rules in order for them to survive the improper season in which they are brought into the world. Therefore, these foods are often full of pesticides, waxes, preservatives and other chemicals that are used in order to make them look fresher than they are. By eating freshly harvested produce, you will be rotating your foods, thereby keeping your body from developing intolerances to certain foods and reaping the health benefits of a diet that is diverse and naturally detoxifying. 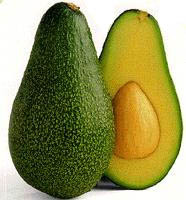 Seasonal foods also have a much higher antioxidant content than non-seasonal foods. ALSO, when farmers (and gardeners) plant the things that grow best in our rather extreme environment, and they don’t try to FORCE things to grow here that shouldn’t be growing in the desert, that helps to eliminate the need for pesticides and fungicides, etc. So… if you can find the time, DO pickle those cucumbers — refrigerator pickles are easy and don’t require pressure canning. Okra is easily freezable: Cut off the stem end and pop them whole into a freezer bag. Similarly, you can freeze summer squash without doing anything special: wash, trim the ends, and dice them. Then, just put them into freezer bags. Store your onions and potatoes in the fridge, and they will last for MONTHS. I’m still enjoying greens that I froze this past spring, and summer squash from my freezer as well. Preserving helps you maximize the value of the CSA, as well. I know I feel GREAT when I pull out some dried basil from the cabinet or diced rutabaga from my freezer, long after the season has ended. I feel like I’m being an excellent steward of what has been provided to me! I do understand that you have to do what works for your family… I truly do. And I THANK YOU, all of you, for participating, whether you’ve been with me from the beginning and are absolutely committed, *OR* if this whole CSA thing is new to you — or eating healthy is new to you — and you’re just trying it out. Everyone is on a different point in their journey to health and wellness, and I’m so very, very pleased to assist any of you at any point in your journey. The short version of this very long post is that it is an EFFORT to eat well. It requires something of you. Time, money, effort, convenience… All of those, or a combination.But the result is worth it, I do believe. Returning to… well, not “normal”. The babymoon filled with tortilla chips* and ice cream** is over. I won’t say that we’ve returned to “normal”, though that is what I was initially thinking… “Wow! We’re approaching normal!” There is no “normal”. And, upon further reflection, it was like thinking, “Hey, baby! You’ve upset our family’s routine! You rascal! How could you do that?? You’ve DISTURBED things! !” And, truly, I don’t think that. But on the other hand, I have been working to re-establish a new flow to our family. But, just to be real, yesterday SUCKED. It was the worst mothering day in a solid year, if not more. Frankly, Jean cries a lot. That isn’t bad, theoretically. I was telling my kids that Ethan cried a lot, and he turned out just fine. Some babies are just… needier than others, and I am happy to provide that extra comfort, extra soothing, more careful… care. But, OTOH, it means a lot of time in my room with the door shut, nursing (not that I always nurse behind closed doors), soothing, trying to help Jean sleep… and then my children are like Lord of the Flies out there, unattended, giving into sin nature, selfishness, unkindness, sneakiness, bullying… Ugh. I kind of flipped out yesterday. 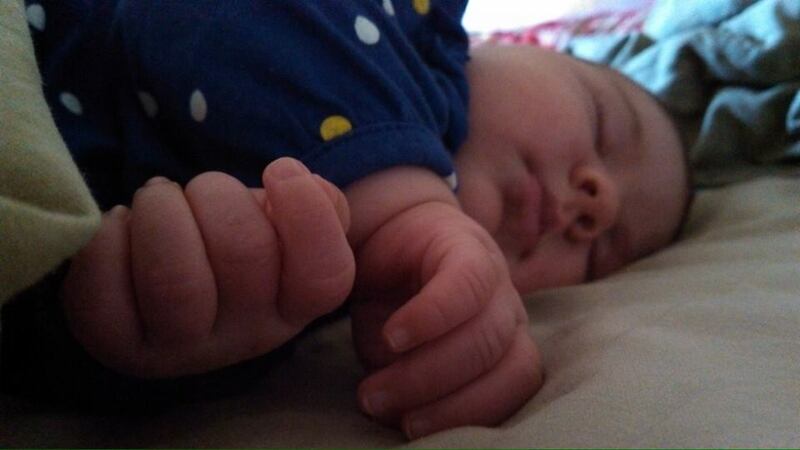 For a valuable 45 min of time when Jean was napping, I sat the five down and we went over Colossians 3:12-17. We talked. I lectured. We prayed. But did things improve? No. I had to spank***. I called Martin. And today hasn’t been much better…. But, I’m trying. Played Bethel YouTube worship videos for four hours straight in the main living area of our home, both to worship and sing, and to just invite the Holy Spirit in our day. And I have nipped everything in the bud, as much as possible. There would be days like these in the past and I would think that I have totally failed as a mother. The good news is that I feel like it’s a temporary failure from which we all need to recover. I need to pull the reins in on my kids after letting things coast, slide, for too long. And they need to be loving and to obey. So, see? There’s no normal. It’s crazy how much even just 12 pounds can make your clothes NOT fit. Even tee shirts. I know that most of that wouldn’t be there had I not daily indulged in food I shouldn’t be eating in the first place: like the aforementioned tortilla chips, ice cream, and cereal. Where would the money come from to do that? More importantly, where would the TIME come to do that?? I need to lose at least some of that weight. So worth it… the tears, the “disruption”, the extra weight… So amazingly worth it. *Organic, from Costco. I love those chips!! **Ben & Jerry’s Karamel Sutra. It was a lot easier to resist when I had to purchase it for $5/pint from the grocery store or wait for a coupon. In the last year, pre-baby, I probably indulged twice. But, since we discovered that the regular price at Walmart is $2.88/pint, and I got my hubby hooked on that particular flavor, it’s been MUCH harder to resist. “Babe!” he grins, coming in the door with a bag from Walmart, “I got you some ice cream!” Hahaha!! ***I probably just lost a good 10% of my readers right there. “SHE SPANKS?? ?” Um, yes. On occasion. I can’t remember the last time I had spanked anyone, prior to Tuesday; a couple of months, at least. It’s not my go-to discipline; it’s my last-resort discipline. ****And if you haven’t read Sarah Bessey’s fabulous post on the Duchess of Cambridge’s post-partum hospital appearance, you should. Absolutely, you should. *****And we’re not talking “skinny” here. I’m at 150 lbs now, and my goal is 140. Pre-baby, it was 138 lbs. This morning, my five children and I sat around our island and shucked sweet corn. My oldest, Ethan (who will be 16 on Sunday), expressed a new appreciation for pesticides. I was a bit shocked, as was Grant, who is 13. It was, however, somewhat understandable. The corn we were shucking was from the CSA, from Crooked Sky Farms. Organic, fresh, but quite wormy. Wednesday is CSA Day, where (currently) 24 people come to my home and pick up their share of local, organic, single-farmer-grown produce. However, on Wednesday, I thought that I was going to have a baby, and I called in the troops — a fellow CSA member who had volunteered to host the pick-up, should I be giving birth or something like that, especially since we’re planning a homebirth. In retrospect, I feel like a chump for calling her, because here it is, two days later, and I still don’t have a baby. The instructions from the farm said to give everyone three ears of corn. She was about halfway through the afternoon when she realized, “We are going to have a LOT of corn left. A LOT.” She upped the remaining people’s share to four ears, but was also worried, like perhaps the farm unintentionally gave too much corn, and they were going to ask for it back. So, she came to my home yesterday with all the leftovers, including four boxes of corn — each box holding 25-40 ears of corn. Clearly, each member could have had SIX ears, and we still wouldn’t have run out. I’m not sure what happened — if they delivered too much accidentally, or if they just gave extra so that folks could pick through the ears and get the best ones, or what. The substitute host has seven kids; I have five (almost six). We happily kept our corn. HOWEVER… I must say, this corn was definitely picked-through, and not nearly as pretty as what you’d see in the grocery store. Most of the ears were, as I mentioned, wormy. (However, cut off the top third or half, and voila! You have a beautiful half-ear of corn.) Some of it was way too mature — dented kernels throughout, telling me that it was over-ripe, and that the sugars had turned to starch, and that it wouldn’t be good eating. Some of the ears were just too worm-eaten or even moldy, and the whole ear had to be chucked into the compost bin. So… It wasn’t exactly pretty work, shucking this corn. There was a lot of, “Eeeewww…” and ears dropped like a hot potato when pulling back the husk revealed three caterpillars, happily munching away at the kernels. Wesley (age 11) eventually got grossed out and became mostly the guy who carted all the shucks, silk, and “dead” ears off to the compost bin. Audrey (age 7) became distraught that I wouldn’t allow her to make a habitat which would enable her to keep all the caterpillars. Indeed, I was insisting that everyone simply throw away the caterpillars in with the shucks. She was horrified by my casual discarding of life. However, Ethan, Grant, and 4-year-old Fiala hung in there like champs to the very end. I wish I had a “before” picture to show you just how ugly this corn was… But, I didn’t take a pic. You will become [a]My spokesman. We have enough “pretty” whole or mostly-whole ears of corn to give us two — maybe even three — nights of sweet corn feasting with our dinners. And that is for our aforementioned large family of seven. I also took the not-so-pretty ears — those which were less-than-half-sized, those which needed multiple kernels trimmed out, or even whole sides cut off, due to being dried or worm-eaten, etc. — and cut the remaining good kernels. Those efforts resulted in a couple of knife nicks on my left hand, a partially numb right index finger from grasping the knife for six passes per ear… AND, five quarts of kernels to add to our freezer. I feel like that’s a win. 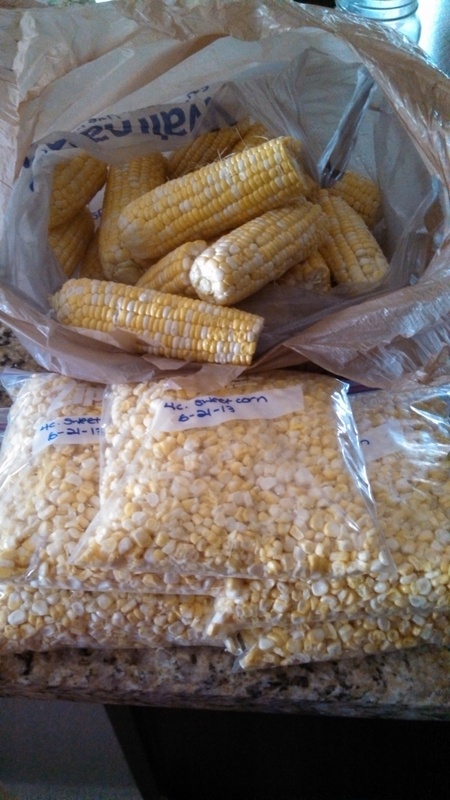 It’s hard to tell from this pic, but there are probably 25-30 ears of corn in the plastic shopping bag — most of them only partial ears…. But it’s a lot of corn! I don’t know how to explain it… It just feels redemptive and rewarding to have rescued all that corn… to have worked for it, toughed it out when the going was gross, and now my freezer is stocked and we will feast on hot, buttered, salty corn-on-the-cob tonight. Things around my home (NOT baby-related — mostly) this last week. When I roast beets, I don’t trim them quite as much as the linked-to instructions. I trim the roots just a bit, and leave 1/2″ of the tops on. I put about 1/2″ water in the dish, and cover tightly with aluminum foil, then roast at 425 degrees for 30-45 minutes, and leave in the oven for about another hour. Then, I cool them at room temperature, and slip the skins off under running tap water. When I make a dish for the family to eat, it’s always my hope that EVERYONE will like it. Something that all seven people at the dinner table will adore has proven rather elusive, however. I now see this as a good thing, mostly. For instance: I made sauerkraut earlier this week, and it is done fermenting today. My 13-year-old son has been highly anticipating its readiness, and is already preparing his sandwich in his mind. He mentioned that he wishes we had ham, but we don’t. So, he’ll have turkey, mustard, and sauerkraut. Not everyone else is so excited. 🙂 But, other family members are expectant of different foods. I am roasting six bunches of small beets right now. My three youngest children are REALLY excited about that. I have received beets a number of times these last few months from our CSA and only ONCE have the beets actually made it into a dish. The rest of the time, after I roast the beets, peeling them becomes somewhat of a party, with everyone popping cooled, newly-peeled baby beets into their mouths, just like candy. I can’t say that I’m disappointed that not everyone feels this way about beets. My husband can’t stand them. My older two boys are rather ambivalent. The rest of us ADORE beets. Our new home is an older one, and it is an endless project. We knew it needed more insulation, as some of it was missing in wide swaths, some was thin and compacted, and some of it had shrunk away from ceiling joists and the outer walls. When we got our electricity bill for the time spanning from mid-April to mid-May, and the stinkin’ thing was north of $350 (and that is with our air conditioner thermostat set at 80-81°), that was a wake-up call. Last weekend, my husband Martin, after quite a bit of research (wet-blown cellulose? dry-blown fiberglass? fiberglass batts? do-it-yourself? or hire it out??) he decided to do dry-blown fiberglass, which requires a big machine. The blowing machine is rentable from Home Depot, or free with the purchase of enough packages of insulation. It was quite an undertaking. 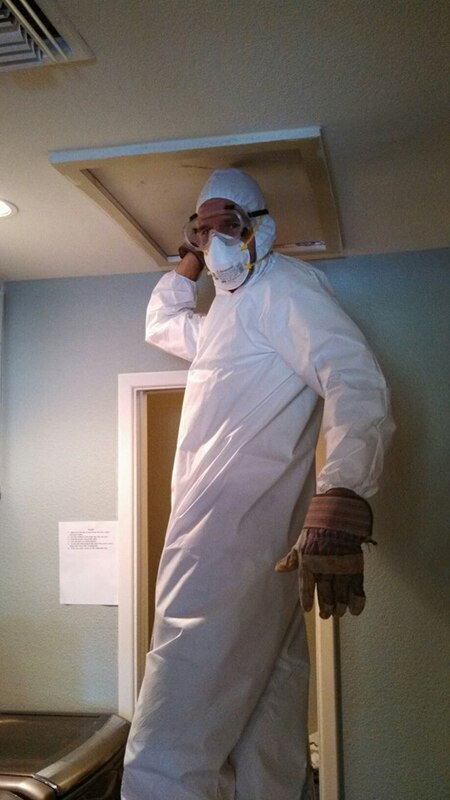 He purchased a head-to-toe coverall, and with goggles, mask, and gloves, ventured up into the attic. Actually, we have two attics, as part of our home is single-level, and part of it has two stories. It was hours of work. Our oldest son, Ethan, stayed at the ladder and fed the tube up into the attic as needed, and relayed hollered messages to our next-oldest son, Grant, who was feeding the batts into the blowing machine and turning it off and on as needed. At Home Depot, they supplied a cardboard measurement stick, telling us how deeply the insulation needed to be to supply a certain R-value. “How deep does it need to be again to reach R-38?” he asked Grant. “Thirteen inches,” Grant replied. “Good. We have about R-100 in most places,” Martin announced with satisfaction. The one we have is the 2011 model of this same washer — very similar. We purchased it in July 2012 at a place which sells “new-old stock” and I’m *REALLY* pleased that we decided to purchase from there, as it came with the manufacturer’s warranty, rather than the scratch-and-dent place we’d been considering, which was less expensive, but with no warranty. In the above pic, you can see a bit of the washing machine, with which I have a love-hate relationship. It is an LG, and when it works, it works WONDERFULLY. However, yesterday, we had the LG repairman out for the SEVENTH TIME in less than a year. Seven times. Granted, his visit on Friday was a follow-up from Tuesday’s assessment, and he was installing the parts that he had ordered on Tuesday. And two of the previous visits were — umm… — due to user error, as a quarter coin had slipped into the wash undetected, and had lodged in such a way that it was keeping the drum from agitating. BUT, this washing machine was the most expensive purchase my husband and I had ever made, barring cars and houses, in our 18 years of marriage, and frankly, I didn’t expect the thing to be a lemon. Or, I don’t know if it’s a lemon, exactly, but it just doesn’t seem that such a high-tech and expensive item should continually require repairs. So now, we are considering purchasing an extended warranty. I have kind of a moral objection to extended warranties. My thoughts are, “BUILD IT RIGHT IN THE FIRST PLACE, AND AN EXTENDED WARRANTY ISN’T NECESSARY!! !” And yes, this is said while shouting. I’m also kind of upset, because, before purchasing this unit, I did a lot of research to find the right product for our lots-o’-laundry family. This washer had glowing reviews and was universally touted as a heavy-duty, GIANT-capacity washer with few problems, certainly less problematic than a front-loader. However, the LG guy has been refreshingly honest with some information that I wish I had access to before I purchased. He has mentioned that, while the unit is power- and water-efficient, it actually runs better on the cycles which use more water (mostly the “Bulky/Bedding” setting). Also, the heating element in the washing machine, which allows the water to heat up super-hot (in the “Sanitary” cycle) especially for whites and cloth diapers, isn’t particularly powerful, and it takes a LONG time to actually heat the water. In the meantime, as I had observed, the washer just slowly spins, waiting and waiting and waiting for the water to heat, automatically adding MORE time to a cycle that is already THREE HOURS long. I guess I’m not the only LG customer who feels rather crabby about this, because just last night, I saw an ad for a new LG washer that heats up super-hot, but has an incredibly short cycle time. Hmph. Another thing I had wanted to add to our home is a clothesline. In our last home, the HOA forbade them. Even in the back yard. This house has no HOA and plenty of space. However, my husband wants to do the clothesline “right”, on its own separate poles, sunk in concrete, on the side of the yard, out of sight. But… that has been added to the very long list of to-dos, here in the house, and we have now been here ten months with no clothesline. So, last weekend, I procured four eye bolts and screwed them right into two trees in our back yard, and strung up some perfect nylon rope, handily left in the shed by the previous occupants. Voila! Clothesline. So, for a little more than a week now, I have been hanging up about 95% of our family’s laundry — everything except my husband’s clothes and the bath towels. Our handy new LG dryer (with which we have had no problems) has a great moisture sensor, and the few items from each load that go into the dryer are completed in about 20-25 minutes, instead of the 50-60 minutes each load was previously taking. A friend on Facebook (well, she’s a friend in real life, but she mentioned this on Facebook) said that she finds hanging clothes to be “meditative.” I didn’t quite understand her at the time, but now I do. I bring out a glass of ice water, put my basket of wet clothes on a chair, and actually enjoy the quiet efficiency of hanging clothes. I’m outside (which I love anyway); the sun is shining on me; it’s a gentle form of manual labor; I feel like I’m…. 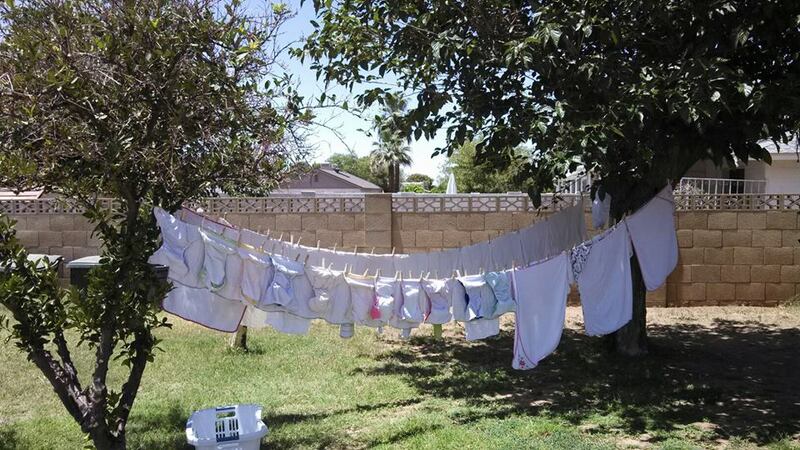 benefiting our family by saving money on power that would otherwise be spent on the electric dryer; it feels satisfying to provide my family with freshly sun-warmed and sanitized laundry; and it just feels RIGHT to be using the plentiful solar energy here in the desert to dry my clothes. Even when the day is hot (though I typically hang the clothes in the morning or evening), I have my ice water, and when I stand between the lines of damp clothes, the breeze cools and refreshes me… It is, indeed, a meditative activity. This week’s produce. We had a selection of summer squash, Armenian cucumber, red potatoes, Swiss chard, arugula, baby sweet onions, heirloom tomatoes, and beets! With the Crooked Sky Farms CSA I host, I feel like we have a good plan for what’s going to happen when the baby comes. The sixth week of the summer season is on Wednesday, June 26, and the baby is due on the 27th. And… the baby could come at any time, really. I’ve been anywhere from 11 days early (twice!) to eight days past my estimated due date. While there have been a number of people offer to help, the most promising person is, ironically, a woman with seven kids. She hosts a raw milk pick-up (where I am a customer), so she is rather familiar with the ordeal of people coming to her house over the course of an afternoon and picking stuff up. 🙂 Also, she’s a stay-at-home, homeschooling mom whose oldest is 16. Just like me! She said that she would be happy to either come to my home and host the CSA for a day, or to even have it at her house. So, the plan is that, if I have the baby on a Monday, Tuesday, or Wednesday, she will have the CSA in her home. If I have the baby Thursday, Friday, or Saturday, I’ll probably just tuck myself upstairs with the baby and she will stay here for the afternoon, with my kids helping her. If I have the baby on a Sunday, it could go either way. That’s at least the plan. Another woman, who participated in the spring CSA season, sent me an e-mail yesterday saying that she would like to help around the time the baby comes, if need be. I was quite touched by her thoughtfulness. She isn’t participating during the summer because she has her own garden which is being very productive right now — no need to pay $20 for organic veggies if you grow an abundance of your own! I sent her a reply sketching out the basic plan, and asked if she’d like to be back-up, or perhaps be the host (as her home is much closer to mine, and would be less of a deviation from the regular plan for the other CSA members). Anyway. It just feels nice to know that things are taken care of, and that people are kindly offering to help out. 🙂 I feel surrounded by wonderful folks. Ah, those artichokes… Who knew they could be such trouble-makers? My seven-year-old daughter, Audrey, is still recovering. Actually, it’s not the artichoke’s fault. And of course, being seven, she is just not letting this drop. It has been nearly a week now, and she still isn’t letting me live it down. “Remember the cooked ladybug I found? Mommy, why would you cook a ladybug? Couldn’t you have found him first? I don’t ever want to eat a ladybug. I don’t think I want artichokes anymore. If you make artichokes, will you please make sure that all of the ladybugs are out of their homes? Open up each artichoke and check it first. Please don’t cook anymore ladybugs.” And this patter is still frequently accompanied by tears. And, yes, this is the same daughter who will no longer eat pork, since we read Charlotte’s Web about a year and a half ago. In related news, I think the CSA members are getting tired of artichokes; quite a few traded in their allotment of five. As the CSA coordinator and host, I’m the recipient of the cast-offs. Plus, I think the farm shipped extra yesterday. The result?? I have FORTY-SIX artichokes. Forty-six. Plus, they’re all quite small. Not quite babies, but still, quite small. I’ve been looking at my crate of ‘chokes, and decided that I needed a new recipe. I usually prepare artichokes by the fairly standard method of cutting off the top 1/2″, steaming cut-side-down in salted water to which I’ve added lemon slices and garlic cloves…. Then dipping the leaves (petals, actually) in mayo (homemade is best, of course, but I usually purchase mayo from Trader Joe’s — all natural, in a glass jar). The recipe, Sautéed Baby Artichokes, calls for Herbes de Provence — of which I have none. I will cook these tonight, and use minced fresh basil instead, and subbing pecorino romano for the called-for parmesan cheese. Pretend you’re a part of my CSA — here are some info sheets with recipes for you! One of my most FAVORITE discoveries of this CSA season: Crisp, mild, delicious Hakurei turnips. Pic borrowed from the blog Cibo e Familia (Food and Family) who also discovered Hakurei turnips via her own CSA! Every week I make info sheets for my CSA members. We receive eight different items and I choose three of them to highlight — usually the more unusual items in the week’s basket. It might be a long shot, but I thought maybe y’all would be interested to take a peek, either to see what you’re missing, or to give you ideas on how to use some more uncommon produce items! Click each date for a Word document. 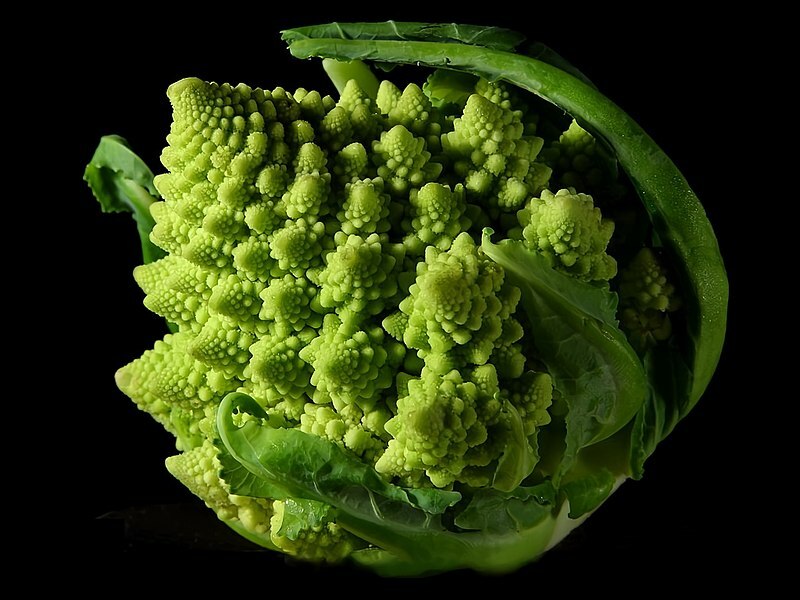 Week of 02/13/13 — Featuring Romanesco, Hakurei turnips, and Swiss chard. Week of 02/20/13 — Featuring Wheatberries*, Tuscano kale, and fresh Fennel. Week of 02/27/13 — Featuring Broccoli di Ciccio, Mizuna, and Cilantro. Week of 03/06/13 — Ummm… I accidentally did a “save” instead of “save as” while writing over the top of this document and lost it. It featured Mustard greens, as well as more ideas for Mizuna and Cilantro — the last two ended up NOT being in our basket for that week, after all… Instead were Red Russian Kale and new-to-me Quelites (which is a spinach-like leaf of the young quinoa plant). Week of 03/13/13 — Featuring a recipe for Easter Egg Radishes and Cilantro, as well as info and recipes for Dried Red Chiles and Dried Beans. *As in, whole grain wheat. I didn’t partake, obviously, but provided preparation ideas and recipes for others who could! I hate to call any food endeavor on which I embark a “diet”. But, I guess how I’ve been eating for the last 3+ weeks qualifies, since I’m counting carbs. It took me a bit, but I figured out that I need at least 80 net carbs daily to NOT lose weight. My goal is NOT to lose weight; it’s to maintain or to gain weight more slowly. By 21 weeks, I had gained 22 lbs. Once my morning sickness was over (bless God) I was packing on two pounds a week, all while eating GOOD FOOD. Now, I’m eating MORE good food, but fewer carbs. I have veinous problems. I have varicose veins including up into my lower abdomen. More weight gain is even harder on weak veins. And my particular kind of veins increase my risk (moderately) of hemorrhaging during birth. Not good. I have a history of macrosomic babies. My smallest was 8 lbs 13 oz. My largest? 10 lbs even. Large babies increase one’s risk of hemorrhage. This is my 6th baby. For every baby >5, a mother’s risk for hemorrhage increases quite dramatically. I am planning a home birth and want to maximize my chances for success — to actually BIRTH in our home, not have to transfer due to blood loss. I did a similar diet under an OB for my last birth — I gained zero weight from weeks 28 onward — and the baby was STILL 8 lbs 13 oz. In pregnancies #1-4, I gained 37-50 lbs each, ALL WHILE EATING A HEALTHY, WHOLE-FOODS DIET. My first OB told me that, for some women, their bodies go into “starvation mode” and operate with extreme efficiency, grabbing onto everything it possibly can and storing it as fat. He was pretty certain that that is what my body does. I did a food diary for him for a month (as I recall — it was 16 years ago!) and he was impressed with my diet. The only thing he recommended was taking out fruit. I didn’t, which is why I probably gained those 50 lbs. With pregnancy #5, on the lower-carb diet, I gained a total of 17 lbs, produced that 8 lb 13 oz baby, and recovery was immeasurably smoother for me, post-pregnancy. It was fairly easy to lose that extra 10 lbs, as opposed to being faced with a whopping 40 lbs to lose. I didn’t even have to try to lose those 10 lbs. They just melted off with a return to my regular metabolism, plus nursing. For this pregnancy, in a couple of weeks, my midwife — who does offer the syrup-based oral glucose test, which I declined — is going to test how my body handles a “normal”/high amount of carbs via a large meal. I’ll go into her office at 7:30 a.m., and we’ll do a blood draw and test my blood-sugar levels. (She’s also going to re-test a couple of other things that were abnormal in an earlier blood test.) Then, I’ll go home and eat a “regular” breakfast — not one that contains 100 grams of glucose like the oral glucose test though it will be higher in carbs than I would normally eat for breakfast; I’ll probably eat eggs and a homemade muffin or two and shoot for 50 g carbs or so. Then, she’ll re-test my blood at 10:30. We’re testing mostly out of curiosity. No matter what the results are, I’ll still maintain my current diet. So, what am I doing in this “current diet”? Eating about 75-100 grams of protein daily, which is very similar to the Brewer/Blue Ribbon Baby Diet. (However, I’m not tracking my protein consumption down to the gram.) I eat 3-4 eggs every breakfast. I eat meat at lunch and dinner. My snacks tend to be high-protein, as well — nut-based or plain yogurt. Eating an additional 30+ grams of dietary fiber carbs daily. Eating at least NINE servings of veggies daily. NOT tracking fat consumption. At all. In fact, I can pretty much guarantee that this is a high-fat diet. Keeping my sugar-intake extremely limited. This is all sugars, including honey and naturally-occurring sugars in fruit. Drinking 80-100 ounces of water daily. This is in ADDITION to other liquids I may drink. I actually shoot for a gallon of water daily (128 ounces) but rarely hit that goal. Taking supplements in addition to the foods I eat: 6400 IU vitamin D, 1000 mg cod liver oil, 1200 mg calcium, 600 mg magnesium, 250 mg Horse Chestnut extract, a multivitamin, and 500 mg vitamin C. Some of them are chewables, which accounts for the 3g carbs for my vitamins if you view my sample daily diet PDF. If I take an extra vitamin C chewable, that adds another 2g carbs. 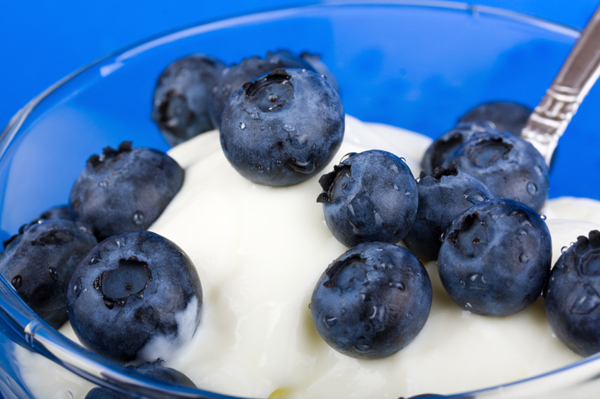 Plain, whole milk yogurt with blueberries: My frequent sub for ice cream at the end of the day. Yes, I drink coffee. Two mugs of half-caff. I put organic half & half in it, along with stevia. I do use a kitchen scale for many foods. I use this website: Self NutritionData to calculate the content of most of my foods. I usually don’t include ingredients in my daily tally, but on the opposite page of my spiral notebook, I do some serious figuring to many recipes in order to figure out the carb and fiber grams per serving. Yes, this does require some math. No, I don’t mind. Some things I have to estimate. For instance, we go out to eat about twice a month. I made a rough estimate of 60 grams carbs plus 10 grams fiber for a recent (splurge!) lunch at a Mexican restaurant. This was for beans, corn tortillas, and some tortilla chips that went along with my shredded beef tacos. But… some restaurants — chains, especially — publish their nutrition data online. For instance, I ate a Double-Double Protein Style Animal Style (with “wheat allergy” noted) at In ‘N’ Out Burger. No fries. I drank water. That felt like a splurge, but I found out online that it as only 8g carbs plus 3g fiber. Organic celery sticks with sunflower butter (I get sunflower butter from Trader Joe’s. Yes, it has a small amount of sugar in it). There are a few gluten-free, low-sugar, high-fiber snack or protein bars — like ProMax LS or ThinkThin Or Kit’s Raw Organic — and I do buy a few of these to eat in a pinch. But, I tend to shy from packaged snacks. At the end of the day, especially if I need more carbs, I will sit down with a bowl of plain yogurt with blueberries or — if my carb count has been REALLY low for the day — 1/2 cup of g.f. granola. It’s odd to consider, but if you truly stick with virtually all veggies, nuts, and meat during the day, by the end of the day, you will have to eat a relatively carb-heavy snack or meal to KEEP yourself from losing weight. I will admit that, once this month, I splurged at Yogurtini. I eat frozen yogurt about once a month from the store. Yogurtini’s no-sugar-added flavors do NOT contain aspartame (they are sweetened with maltodextrin, sucralose, or other “non-sugar” sweeteners) but they DO contain artificial colors. This is not a choice that anyone should make on a regular basis, but I’m just keepin’ it real and honest here and admitting to my yogurt consumption. One five ounce serving (including a scoop of fresh blueberries) ran me about 22 g carbs and 7 g fiber. I’ve been newly employed this year as a coordinator for a CSA — a farm share program. For the last four weeks, folks have picked up their locally-farmed, organic produce at my home every Wednesday afternoon. It has been more work than I had anticipated, mostly in managing everyone’s quirks and preferences and keeping everyone happy. I’m not very good at that, in my own nature, but I’m trying and I’m learning. Something that I am coming to understand is that, no matter what, some people are just thankful and pleased, and others are just grumpy. Blessedly, I have many more of the “thankful and pleased” sort of folks: I have received many genuine thanks, both spoken and in e-mail, from our now-24 members for the efforts that I’m making on their behalf. That’s endlessly encouraging. I participated for a couple of years in a different CSA and this particular one — through single-farmer-owned Crooked Sky Farms — is excellent. They wash and portion-out everyone’s share. There have been a few missteps, but generally communication has been excellent. There’s a weekly trade basket, so if you don’t want Red Russian Kale, for example, you can trade it in and pick out three navel oranges instead. The farm — including one particular employee, who rather runs the place — works diligently to satisfy everyone’s needs, as best as she can. For instance: Even though every week’s share is eight portions of in-season produce, the most that any one particular thing has been repeated is once; the farm is mindful of trying to provide as much variety as possible. So, in our four weeks, 32 portions total now, the most we’ve seen any one thing is twice. On my end, too, I do my very best to take care of everyone’s needs: Letting them come early, letting them pick up late, using my personal share to supplement theirs if something runs short, making note of what they like or don’t, compiling weekly documents that contain info and recipes for the produce that might be less familiar, communicating regularly via e-mail, etc. I’m not trying to pat myself on the back too hard, but I think both the farm and myself are doing a good job. I just listened to her, and then suggested that she trade it in. However, as she was one of the last people picking up, the trade basket only had curly mustard greens and arugula in it, in addition to more dill, and she didn’t want those, either. She just puffed her disappointment and left. I tried to let her words roll off. “Not gonna make everyone happy…” I thought. It was only the second time in four weeks that we’d received dill and only one of the eight things weekly have been herbs; I don’t think that’s excessive. But I do understand her sentiment; I’d probably rather have a big bunch of carrots than a bunch of dill, even if the portion of dill is generous — and it is; it’s probably 4-5 times what would be in those little plastic packs of fresh organic herbs which you can find in the grocery store produce department. Still, though… After she left, I felt a little emotionally bruised. Then, the next person came in to pick up her produce. She had started a little late in the season; this was only her second time picking up produce. “Oooh, is that dill?” she asked, eyes wide, pinching a leaf and sampling it, “It is! I love dill. I could smell it before I even tasted it.” She clutched the dill to her chest. “To me, dill smells of home and my mother…” She went on to tell me that her mother — now sadly deceased — used to regularly make homemade bread using fresh dill, and it was one of her favorite memories and favorite smells. She firmly stated she would be making some fresh dill bread the next day…. She seemed close to tears. I thought of that woman’s own daughter, and how this bit of herbs in her hand would be the vehicle to pass on a treasured childhood memory to the next generation. I was then close to tears. That interaction erased the negative words of the previous CSA member. It felt… powerful and perfect. I was serious about the smell of dill…it is home and momma and love and snuggles on a cold winter night to me…made me cry actually and now relishing all the sweet memories it brings…cant wait to make that dill bread tomorrow… csa is more than veggies, for sure. 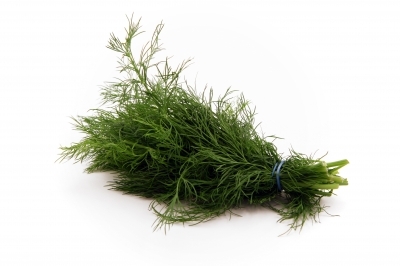 If anyone else complains about dill, it will be water off a duck’s back, for certain. It’s all worth it, grumpy customers included. a greying blanket covered all the vale. as filtered through a cloth, soft on the eyes. The raindrops sprinkle glasses, windshield, face. a simple shower, making my heart glad. has made me smile upon this fine, wet day. ALL CONTENT © Only Sometimes Clever. If you'd like to publish any recipe on your blog or in any printed material, PLEASE LINK BACK to the original page, or at the very least, provide a general link to my blog. If you have any questions, please e-mail me. CLICK HERE TO E-MAIL ME! Kel LiewHi! Just came across your blog after searching for some zucchini allergy I might possibly contacted. Donate to OSC by PayPal if you'd like. NO PRESSURE. PSA. Or, what to do when your kids don’t turn out like you. Summer is over (sort of). Featuring way too many pictures. In which I unintentionally become an unschooler. Sort of. Paper on why immediate cord clamping is harmful to newborns.